It is an interstitial space between the protected inside of the construction and the open garden. The ramp, long and smooth, extends the transition from the interior to exterior creating the constant sensation of environment changing. This solution was vastly used by Brazilian modernism, which consecrated the radical use of ramps as a way of vertical circulation while reaffirming the Corbusian precepts of architectural promenade. 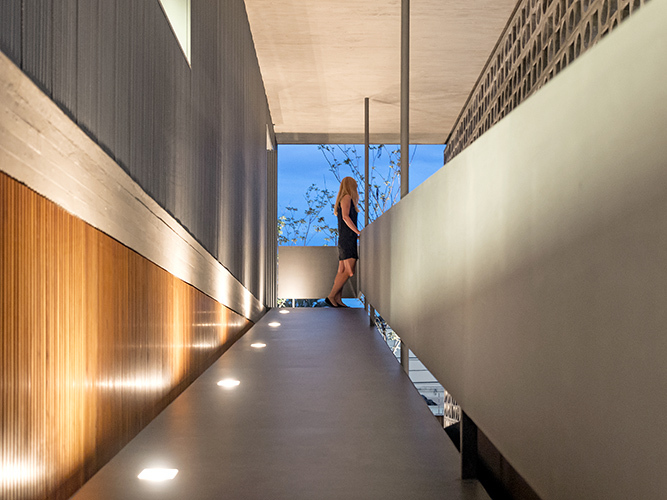 There is an intentional uncertainty about the character of this space: internal or external?he arrival at House B+B – the access to the social area – is through an architectural trajectory, via an open ramp, located on the eastern side of the construction. This space is protected by hollowed-out concrete elements to the side, which create surprising effects of light and end up functioning as protection from bad weather conditions. 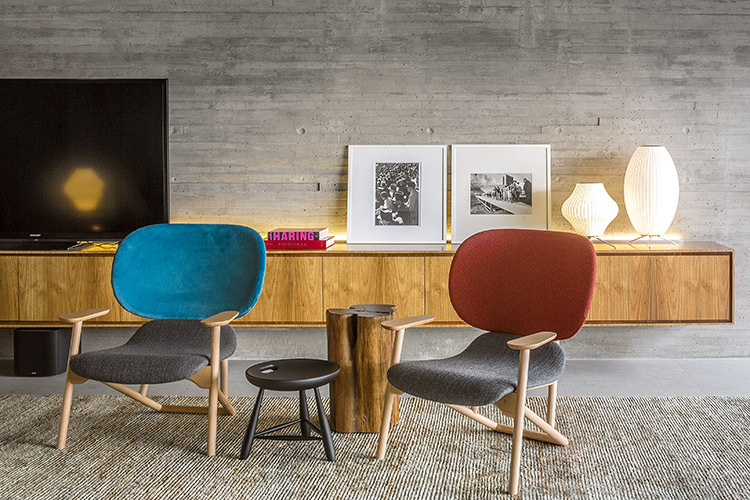 The social area of the house creates a sensation of coziness and comfort, in an open space, without any structural interference for the organisation of the furniture layout. A 3.5m sliding door allows the kitchen to be completely integrated into the dining room. The counter used for food preparation is behind the window overlooking the ramp and receiving the ‘constructed’ light, filtered by the hollowed-out elements. Thus, the kitchen becomes a lit-up space and a pleasant ambient. Different than the usual solution, the rooms are on the ground floor – in direct relation to the garden – and can be also accessed internally via a staircase connected to the living room on the top floor. The wooden elements on this floor’s facade allow for the internal control of the sunlight and thus provides for a great thermal performance. The use of ‘raw’ materials such as exposed concrete and wood give a lively aspect to residence, constantly changing over time. The architecture of B+B House sought to create a cozy, welcoming space, an intimate home as much for the daily lives of the residents as well as for the reception of friends in social gatherings. Studio mk27, located in the chaotic city of Sao Paulo, was founded in the early 80s by architect Marcio Kogan, and today consists of 28 architects as well as several collaborators worldwide. 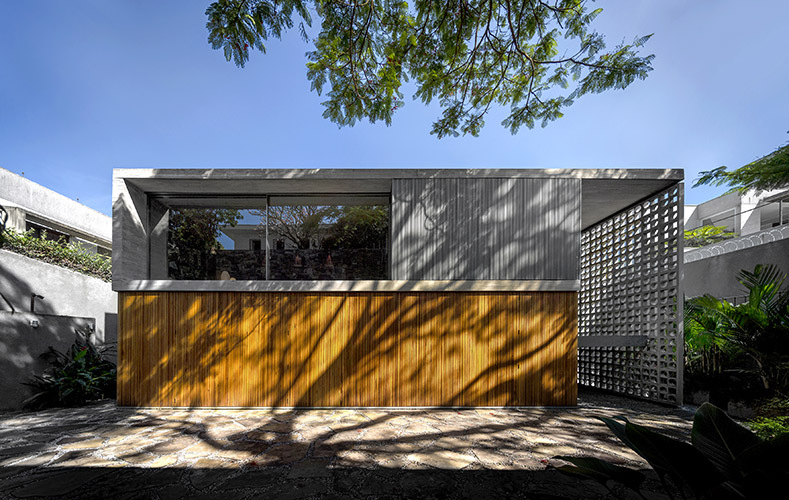 The team of architects, great admirers of the Brazilian modernist generation, seeks to fulfill the difficult task of rethinking and giving continuity to this iconic architectural movement. The projects of studio MK27 are valued for their formal simplicity, always working with special attention to detail and finishing. Kogan is an honorary member of AIA (American Institute of Architects), professor at Escola da Cidade, and was considered by Epoca magazine as one of the 100 most influential people in Brazil, and is part of the list “The Wallpaper. 150 Famous for 15 Years”. He leads a team of architects, who at large, have been working with him for over a decade. Since 2001, when he started a co-creation and cooperative work system at the office, Studio MK27 has won over 200 national and international awards, such as IAB (Institute of Brazilian Architects), Sao Paulo Architecture Biennale, WAF, Architectural Review, Dec., Minosse, Record House, LEAF, D&AD, Spark, Barbara Cappochin, Iconic, A, and Wallpaper Design Award. The team at Studio mk27 has spoken at the Royal Academy of Arts, AIA, Societe Francaise Des Architectes, Clubovka, FAU-USP e Mack universities, FAAP, Polytechnic of Milan and Valencia, South Florida, Rice, Texas, among others. In 2012 Studio mk27 represented Brazil at the Venice Biennale which meant some extra kilos for the group of 10 architects who went for a gondola ride.